The development of our teeth is a long process that starts at an early age. It is an important aspect in our life especially since one of our best assets can be found in our smiles. It should be noted that sometimes the services of a regular dentist may not be enough to keep our teeth in good shape and form. Accidents and injuries for instance, is something that cannot be totally avoided however it is good to hear that a particular form of dental service is able to find immediate relief to such problem through orthodontics. There are a number of factors that can affect the development of our teeth. Genetics for example, can contribute to their development of a crooked teeth and this usually happens when jaws become too small rather than the teeth or vice versa. Such issues tend to often happen at an early age and is something some parents often take lightly or for granted. With that being said, if this issue is left unattended for long period of time, this problem can carry over to adulthood which can be very hard to deal with. Cases such as crooked teeth however, can be remedied through the field of orthodontics. Orthodontist in Sydney are quite proficient in helping their clients correct their teeth and jaws that are positioned improperly. Fixing a crooked tooth should be a top priority especially since this can lead to the development of tooth decay and periodontal disease. This usually happens because the teeth are harder to clean because of their position. Another thing to note is that a crooked tooth will also cause extra stress on the chewing muscles that can result to a number of issues. It is good to hear that these types of problem can be treated in a timely and effective manner with the help of teeth braces in Sydney. Dental braces are a popular device that is used by orthodontics in Sydney to help align and straighten teeth. It is important to note that braces are worn for a considerable period of time taking anywhere from 18 months to three years. Because of their long duration, people are often advised to wear braces at an early age to avoid embarrassment in the future. In addition, some health plans cover orthodontic treatment for patient who are under 18 years old making it ideal to get braces during such time. 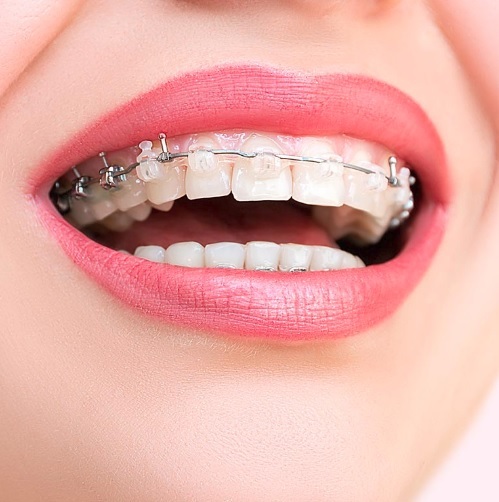 If you do happen to require braces during your adulthood, you may be pleased to hear that orthodontists in Sydney will able to provide you with a noteworthy alternative to your conventional braces. These can be found in the form of Invisalign or clear braces that provide a breath of fresh air with their innovative look and feel. You can wear them all day without worrying too much about how others perceive you as they can be hard to spot. You can learn more about unique dental procedures by getting in touch with an orthodontist in your area today! It takes about 6 minutes to drive coming from Town Hall Station going to My Smile Cosmetic Dentistry. Head northwest on Druitt St toward York St and use the middle lane to turn right onto Clarence St then another right onto King St. Turn left at the 2nd cross street onto George St and in 350 metres, turn right onto Hunter St then finally another right onto Pitt St. You will see our dental clinic on the left side.